Play for free and without obligation! 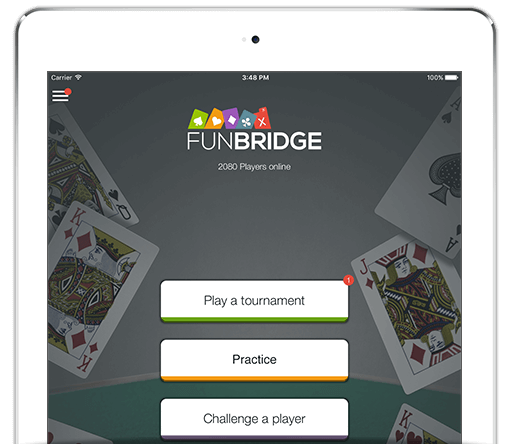 Download Funbridge for free and join the biggest online community of bridge players. compare yourself to thousands of players from now on! On Funbridge, you play the hand in South. North, East and West are played by computers. This way, you are fairly compared to other human players. With Funbridge, rank yourself among thousands of other players and compare your results in the blink of an eye. This makes Funbridge the ideal tool to progress! Funbridge allows you to play your tournaments at your own pace. You can interrupt a deal (pause) at any time to resume it later. You can start a game on your smartphone and finish it at home on your tablet. with our introductory module to bridge! Find out more about bridge rules and learn the basics to play your first deals! Play an unlimited number of 1 deal tournaments! Do not miss this opportunity to improve your play! Every day, take part in a 24 hour tournament gathering all Funbridge players! Access one of the 13 Funbridge series and rank yourself among players of your level! Challenge your friends in one-on-one matches over 5 deals! May the best win! Improve your rank as a federation points holder thanks to official bridge tournaments. Create your own bridge tournaments and share your comments on the deals with the other participants. Create your own team and pit yourself against teams from all over the world. Pit yourself against the best Funbridge players and use this as an opportunity to analyse how they play. Which game modes do you like most? Not sure what is meant by game modes? ACBL tournaments, challenging and challenges from other on-line players. What is the Main Diff. between MP and IMP?